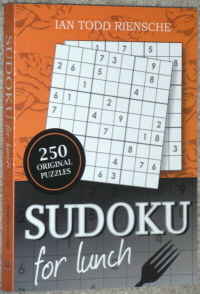 TNT Sudoku is a compilation of Ian's 9×9 Diabolical Sudoku puzzles as printed in the Tacoma News Tribune and The Olympian. To order a copy, click here. To contact the author, email: ian@sudokupuzzler.com. Addictive and mentally stimulating, Sudoku, the number crossword game, will sharpen your mind and help you unwind! In Sudoku for Lunch, Ian has composed 200 original 9×9 sudoku puzzles, and 50 original 6×6 puzzles. The puzzles are arranged by difficulty and named according to time blocks they could appropriately fill, such as Coffee Break, Quick Lunch, or Afternoon Off. Never played Sudoku before? No problem. Ian includes an easy how-to, explaining the logic to solving these encoded puzzles, making Sudoku for Lunch great entertainment for all ages.